With three short weeks until the election, President Barack Obama and Mitt Romney faced off in a tense debate Tuesday, sparring often over a number of small-business issues -- from tax rates and regulation, to health care and international trade -- that impact job creation. According to a handful of polls and the general consensus of the Twitterati, an aggressive Obama was largely considered to have "won" the debate, although reviews always depend on whom you ask. The incumbent was under pressure to make up lost ground after Romney, the former governor of Massachusetts, handily defeated him at their last debate, giving the Republican campaign a shot in the arm. With both candidates looking to break the dead heat, there were plenty of jabs and zingers. In particular, Obama made a dig at Romney's wealth and alleged inability to connect with the middle class by pointing out how much bigger Romney's pension is than his own. For his part, Romney talked about Obama's failure to meet a pledge to reduce unemployment to 5.4 percent, saying that's "9 million Americans without work." Taxes: Of all the issues that business owners care about, how to tax small businesses and who exactly to tax have gotten the most airtime this debate season. Tuesday was no exception. The President pounded the drum, yet again, about the 18 times he has cut taxes for small businesses during the administration. Also, Obama took the opportunity -- again -- to explain how extending the Bush-era tax breaks on only those making $250,000 or less would benefit 97 percent of small-business owners. And Romney talked about the need to extend the Bush-era tax cuts for all income levels, so as not to hit small-business owners, many of which, he attests, report business profits on their individual returns. 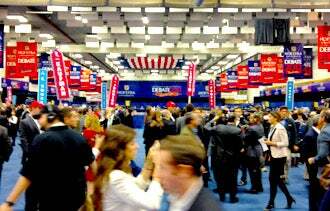 "Spin Alley," where politicians gather after the debate to talk to the press. Meanwhile, in what’s called "Spin Alley," a collection of Democratic and Republican politicians gathered in the media center at Hofstra at the conclusion of the debate to make a case for their party’s candidate. Rep. Nydia Velazquez (D, N.Y.), the chair of the House Committee on Small Business, questioned how Romney would pay for his plan. "If you take the tax plan by Mitt Romney where he promised to cut taxes by $5.3 trillion over 10 years, reducing the deficit and balancing the budget, that means that a lot of tax deductions that are important to small business will be eliminated," Velazquez said. During the debate, Romney connected his tax plan, which he says will create jobs, to his background in business. "I want to help small businesses grow and thrive. I know how to make that happen. I spent my life in the private sector. I know why jobs come and why they go," said Romney. "And they're going now because of the policies of this administration." Republican politicians generally agreed with the perspective that reduced taxes will lead to hiring. "If you want to create jobs, you have to reduce the burden on small-business people and create a climate where they feel they can invest and grow and that is the biggest reason for his tax reform plan," said Jim Talent, the former Senator from Missouri, a former head of the House Small Business Committee and a current advisor to the Romney campaign. Exporting and trade: Early on in the debate, Obama noted that "we are on pace to double our exports" and that helping small businesses benefit from international trade is part of his plan to create jobs. "That means we change our tax code so we’re giving incentives to companies that are investing here in the United States and creating jobs here," he said. "It also means we’re helping them and small businesses to export all around the world to new markets." Obama later attacked Romney's corporate-tax reform plan, saying one of Romney's "big ideas" would allow companies who make profits overseas to avoid U.S. taxes. But, "if you're a small business or a mom-and-pop business or a big business starting up here, you've got to pay even the reduced rate that Governor Romney is talking about," Obama said. The result would be an incentive for companies to move jobs to places like China, India and Germany, he said. Romney countered that Obama hadn't taken a strong enough position on China, saying U.S. manufacturers making the same products here can't compete. He pledged to label the country a "currency manipulator" on day one of his presidency. Regulation and health care: Romney talked about how he wants to decrease regulation to spur small-business growth and hiring. In particular, Romney criticized Obama's health-care overhaul, saying it has had a negative impact on small-business hiring. "The rate of regulations quadrupled under this President. I've talked to small businesses across the country. They say, we feel like we're under attack from our own government. 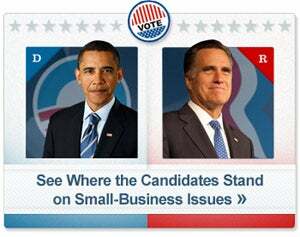 I want to make sure that regulators see their job as encouraging small business, not crushing it," Romney said. "And there's no question but that Obamacare has been an extraordinary deterrent to enterprises of all kinds hiring people." For his part, Obama defended his record, saying he believed in free enterprise. " I believe in self-reliance and individual initiative, and risk-takers being rewarded." The final debate between Obama and Romney is scheduled for Monday at Lynn University in the swing state of Florida. What will you be listening for Monday night that you have not yet heard the presidential candidates talk about so far this debate season? Leave a comment below and let us know.